This year, we add something extra: A colorful PDF version you can download to your computer, or even print out and give to friends. Click link above for PDF. Posted January 17, 2018 by Narrye Caldwell L.Ac.. Comments and trackbacks are open. Follow the comments feed. 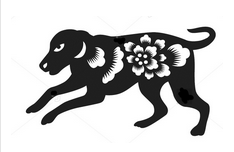 Tagged with: Chinese Astrology, Chinese New Year, earth dog, Narrye Caldwell. Thank you Narrye and Plum Publications for the prognostication for the year! This annual entry on Kaimen is something I look forward to every season. Oh, I so love this comment from Thomas. I couldn�t have said it better about the Chow chow vis a vis the Dog Year.